We’ve all been there. You get dragged to a social gathering where you only know one person -- the person who dragged you there. 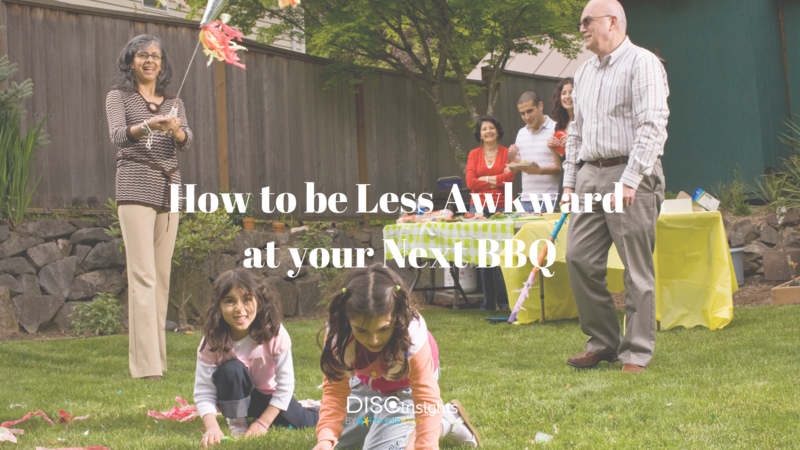 Be it a work party for your spouse, a family gathering that has you asking yourself exactly how you are related to these people, or simply a night out that takes you somewhere new, interacting with new people can cause mild anxiety for even the most gregarious extroverts. For some personality styles, this discomfort is alleviated rather quickly. As an "I," I call this the “fake it until you make it” phase of a social gathering. Even I’s like myself experience discomfort when we are surrounded by unfamiliar faces. For an I, we take this as an opportunity to talk to new people and gain their affection. I’s fear rejection, so we will go out of our way to introduce ourselves to strangers. But this desire to build relationships and gain approval from strangers isn’t universal. How do you engage with other personality types and turn an awkward situation into an enjoyable one? People are all different, but they are predictably different. Once you can identify which of the four main personality types the person you are talking to has, you can better understand how to communicate with them. Start by using your knowledge about personality styles to identify the styles of the people around you. DISC provides you with a blueprint for personality. Once you can identify something about the people at the gathering, you will be better equipped to break the ice. Using behavioral analysis, you can be tipped off as to the personalities of the people around you before you even talk to them. First thing's first, look at their behavior to see if you can tell who is who. How to identify a D style personality: D style personalities are active. They want to do something while they are at the party. They might be feeling social, or they might be feeling competitive. They will be the ones getting people to play yard games or pool, or they might be encouraging people to engage in a group challenge. How to identify an I style personality: This one is easy. The I will practically tell you they are an I. The I is a social butterfly and abhors the discomfort of a silent room. They’ll flit from group to group, trying to get everyone involved in a conversation or activity. 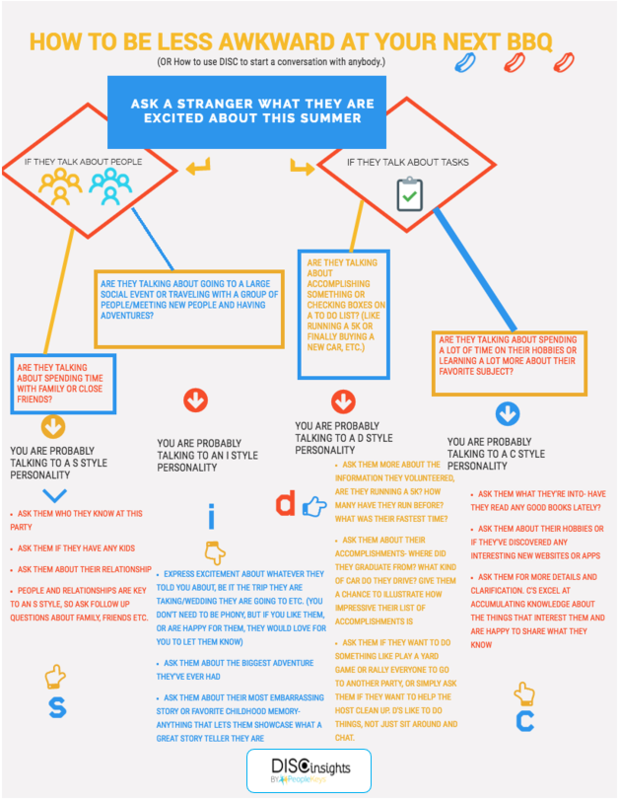 How to identify an S style personality: The S style personalities are probably conversing quietly with the one or two people they have a close relationship with at the event. They are unlikely to engage strangers in a conversation but will be quite talkative when they are involved in a conversation with someone they already know and trust. How to identify a C style personality: The S and C style personalities may be difficult to distinguish from a distance. Neither one is prone to going out of their way to engage with new people. This is not to say that they aren’t sociable; they just require different circumstances to engage in socialization. The S style requires a sense of trust in the person that they are talking to, a sense of camaraderie. The C style is primarily interested in talking about the things that they are into. If the C person is talking to someone about one of their interests, they will be indistinguishable from other personality types. If they don’t have the opportunity to engage in this type of discourse, they might be wallflowers.